Senator Teofisto “TG” Guingona III is currently the chairperson of the Senate Committee on Accountability of Public Officers & Investigations (Blue Ribbon); Peace, Unification & Reconciliation; Health and Demography; and the Oversight Committee on Anti-Money Laundering. Senator TG is a fierce fighter for basic human rights, the enemy of the buwaya and corrupt in the government, and the champion of good governance in the Philippines. First, as a fighter for basic human rights, Sen. TG challenged the legality of some of the provisions of the Anti-Cybercrime Law before the Supreme Court. He felt that some of the law’s provisions go against the guaranteed freedom of speech and expression of the Filipinos as stipulated in the 1987 Constitution. 3)	Hospital arrest of former president Gloria Macapagal-Arroyo where she was charged with plunder for the alleged irregularities in the use and disposition of the intelligence funds of the Philippine Charity Sweepstakes Office. 4)	And recently, after 9 hearings of the pork barrel scam investigation, the Blue Ribbon Committee recommended the filing of plunder and other charges to alleged PDAF scam mastermind Janet Lim Napoles along with other government officials and private individuals. Third, Senator TG is a Champion of Good Governance. He strongly believes in the principles of transparency in governance and accountability of government officials and has advocated for them. He is known to actively promote good governance, ethical leadership and support effective and ethical leaders in government. Now, it is our pride and honor that the man known for being a fighter for the basic human rights, the enemy of the buwaya and the corrupt, and the champion of good governance is here with us today. 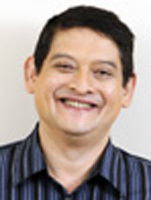 Ladies and gentlemen, let us welcome Teofisto “TG” Guingona III, Senator of the Republic of the Philippines. Ferdinand "Bongbong" R. Marcos, Jr.
Ramon "Bong" B. Revilla, Jr.